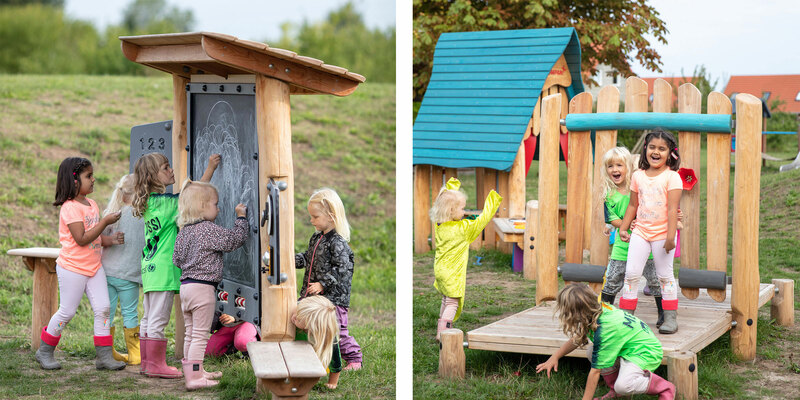 The new Robinia Play, Act & Learn series is KOMPAN's latest innovation in toddler play. With a starting point in toddler's developmental needs, these play items invite creative and dramatic play explorations. 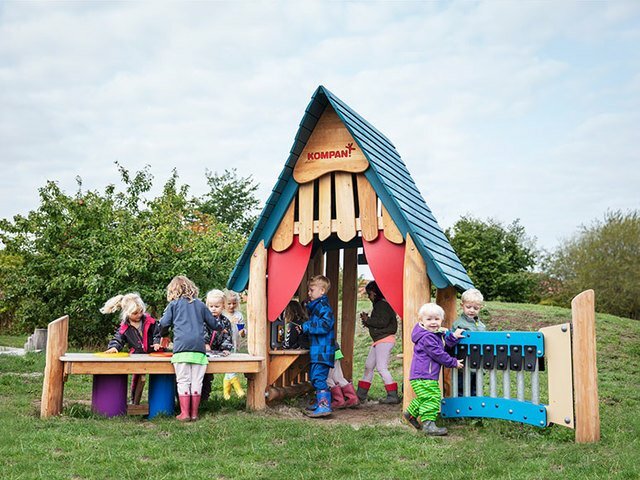 The play cottage is packed with activities to encourage dramatic, social and sensory play. This large structure is highly inclusive, allowing many children to play together from all sides and without conflicts. The small pretend counter, mirror and watch encourage dramatic play and social interaction. These items allow children to rehearse real-life situations and practise their language skills. The small drums and music panels allow the children to explore sounds and rhythms. Children can practise fine motor skills by drawing or maybe practise writing their first letter or word on the chalk board seen below. 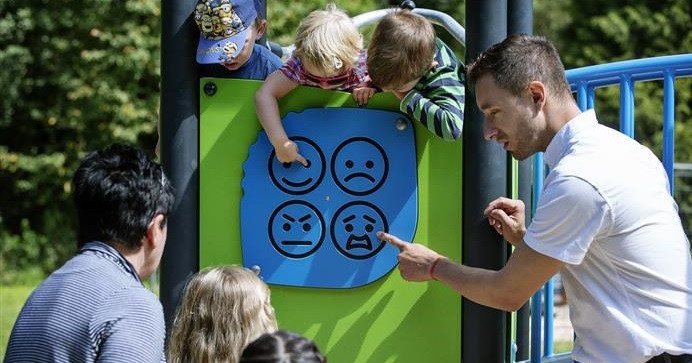 The two-sided structure encourages children to play side by side and interact and learn from each other. Caregivers can use the chalk board as a teaching device and interact with the children as they play. The caregivers can model positive behaviour and observe and guide play. Acting on stage and being able to create their own imaginative play story are true stimulators of a child’s cognitive creative and social skills. Being on stage also trains the child’s ability to stand out in a group and understand themselves in relation to the story and the group. Dramatic play is children’s way to gain an understanding of the social rules and happenings in their surroundings. When playing through these occurrences, toddlers put a voice to and familiarise themselves with the world. Dramatic play also helps develop socio-emotional, language and communication skills.